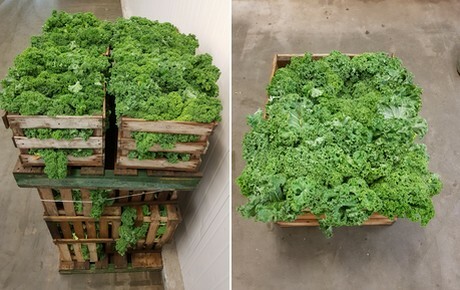 "Luckily kale sales are on the rise again"
Kale is in fashion, even in the north of the Netherlands. Here, the trends tend to be a bit slower to arrive than in the Randstad. "Kale was threatening to become a bit of a forgotten vegetable. Fortunately, it is on the rise again", says Frank Apotheker of the company with the same name. He trades in fruit and vegetables in the Dutch city of Groningen. "Kale often features positively in the news. This is thanks to its health benefits. It is also popular among the students here in the city. They use Kale for healthy shakes and so on." When it comes to health, Brussels Sprouts are also currently enjoying extra attention. They are being called 'Little vitamin C trees'. This is , however, not boosting sales in the North of the country. "People here still eat traditional meals - meat, potatoes, and vegetables. Brussels Sprouts are often on the menu. The weather drives consumption. When it was close to freezing last week, consumption suddenly increased. This is true for all winter vegetables." Turnips and celeriac are also winter vegetables. Traditionally, these also sell well in the north of the Netherlands. There, parsnips have joined the rank of a forgotten vegetable. In the processing industry, fermented sauerkraut from a bucket's popularity is on the rise. "This product is perceived as being tastier and more tender. It also has an artisanal image. Consumers prefer this to sauerkraut from a bag", continues Frank. The sales of chicory and leeks also increase somewhat in the winter. "These are not typical winter vegetables and are eaten throughout the year. Leeks are, of course, an important ingredient in pea soup. However, it is also often used in stir-fries. Chicory is, thanks to its availability, also more of a year-round product. It can be prepared in various manners. This means it can be eaten more often during the year", he concludes.